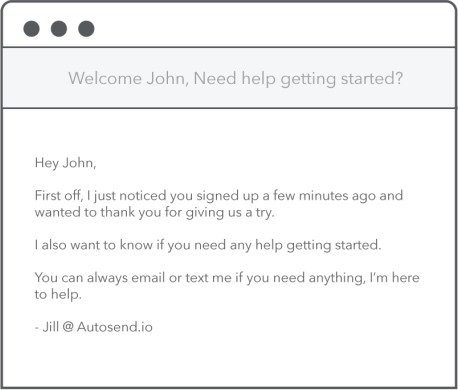 The fact that you need to send a welcome email after signup is a no-brainer. Here’s the catch — are you making the right first impression? We hate to break it to you, but your company may be one of many who is missing a golden opportunity by not saying the right thing. By “right thing” we mean the elements that make up a successful welcome email. If your welcome is basically a signup receipt, you’re doing it wrong. 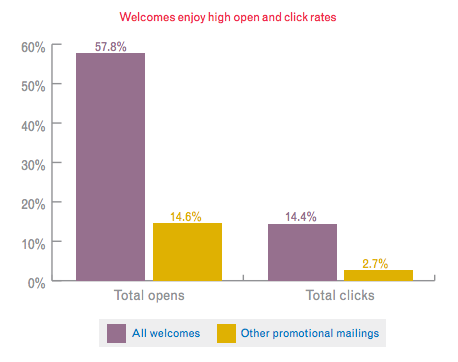 Don’t underestimate the value of the welcome email and it’s ability to impact your business. So, what is so special about the welcome email? “Right after somebody signs up for your service is your moment. You have more attention than you ever will have again from that user to try to teach them what your product is really about,” says Josh Elman. Welcome emails have “four times the total open rates and five times the click rates” compared to other emails, according to Experian. “Welcome emails are purpose driven emails written to carry the excitement of a new user toward a first positive experience with your product or service. They bridge the first steps of the onboarding process – acquisition & activation,” explains Alex Mohr, Marketing Lead at Sendwithus. Great, let’s dive into welcome email anatomy. Don’t worry, it is not nearly as intimidating as learning human anatomy! Which would you prefer someone to refer to you as: “hey you” or call you by your name? Most of us are going to prefer our name. So it will come as no surprise that your welcome email should be as personalized as possible. 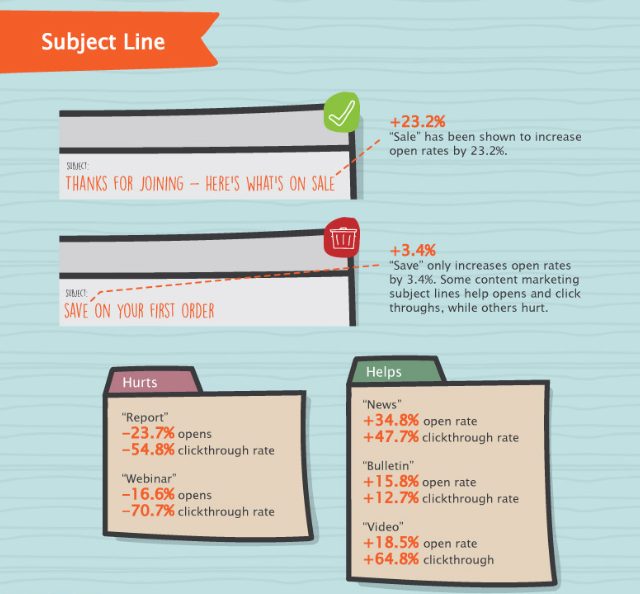 “Emails with personalized subject lines are 26% more likely to be opened”, according to Experian. 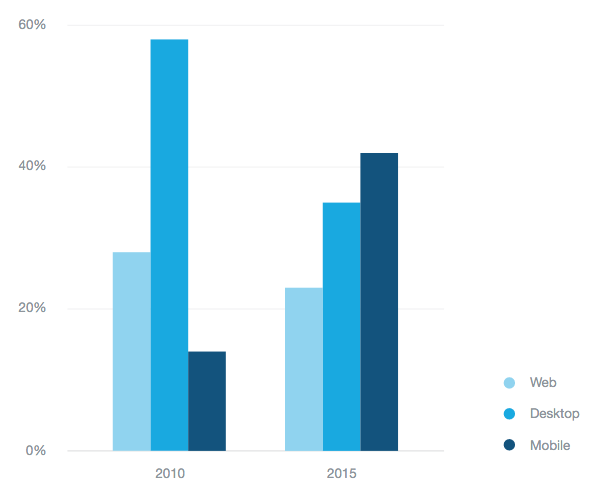 “If you have the data, segment your subscribers using information about how and where they signed up, so you can tailor your welcome email to reinforce their decision,” says Mohr. In addition to using the subscriber’s name (in the email body and potentially the subject line), make use of the information you requested during the signup such as their interests, goals, business type, etc. to further personalize the welcome email. If you didn’t ask about your subscriber’s goals during the signup, don’t worry, you can ask them in your welcome email. We’ll discuss this more in the “Call to Action” section of the blog. 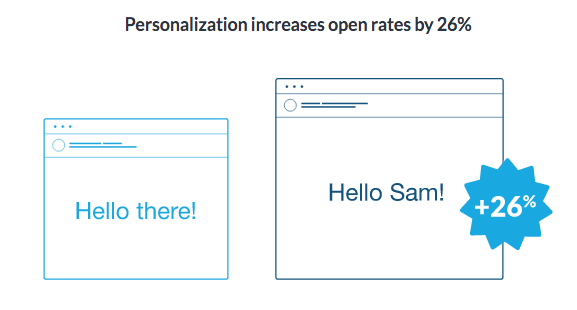 One of the most important aspects of welcome email personalization involves who the email comes from. Do not use a “no-reply” email address! “Nothing is less inviting,” admonishes Enchant founder Vinay Sahni. Give a human touch to your email by having it come from an actual employee and an email address which reflects that. Vero’s welcome emails have an average open rate of 47%. Notice that not only is the email coming from an actual employee it is coming from Chris Hexton, Vero’s co-founder and CEO. Vero is just one of many companies who send welcome emails from the founder or CEO to establish a relationship and build trust. “Emails that came directly from me, rather than from a nameless Groove account, performed better across the board . . . We learned that when users know that they have a direct line to the CEO, they feel more connected to Groove and are less likely to quit if they hit a snag,” says Groove CEO, Alex Turnbull. Enticing. Compelling. Make your subject line something that people want to click on! Think about how many emails you get in a day. And how many you delete without reading. Some companies put “Welcome” in the subject line so the email is easily identifiable. “Research indicates some of the most popular words in subject lines that get opened include: sale, thank you, welcome, new, daily, weekly, alert, bulletin, video, and any type of personalization,” says content marketer Pam Neely. The subject line is compelling, creative, and relevant because “WorkFlowy is a single sheet of paper to hold your whole brain. 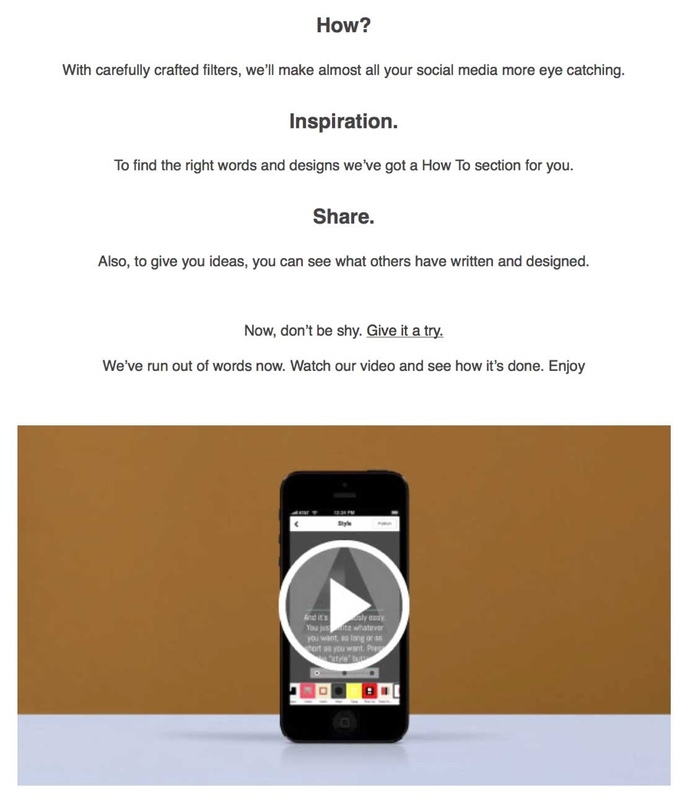 The idea: put EVERYTHING you want to keep track of into it.” The explanation is a quote from the body of their welcome email and connects the subject line to Workflowy’s product benefits. Let’s face it, we sign up for a lot of things these days. Even if you send the welcome email immediately after signup, “the average email is actually read 2.5 days after it’s sent,” according to Autosend. With this in mind, it is nice to remind the subscriber what they signed up for. This is also a nice lead in to setting expectations on how often they can expect to receive additional communications from you, which we’ll cover shortly. Notice what else Laja does in that first sentence — he thanks the subscriber for signing up. Psychology researcher Jeremy Dean explains, we say “thank you because we want the other person to know we value what they’ve done for us and, maybe, encourage them to help us again in the future.” In the subscription business model, reducing churn and maintaining the subscriber long term is an important part of your company’s success so “thank you” is a good place to start the relationship. Part of your welcome email should be telling your new subscriber how often they can expect emails from you. Your email should also give them an easy option to change the frequency of your emails or turn them off completely. 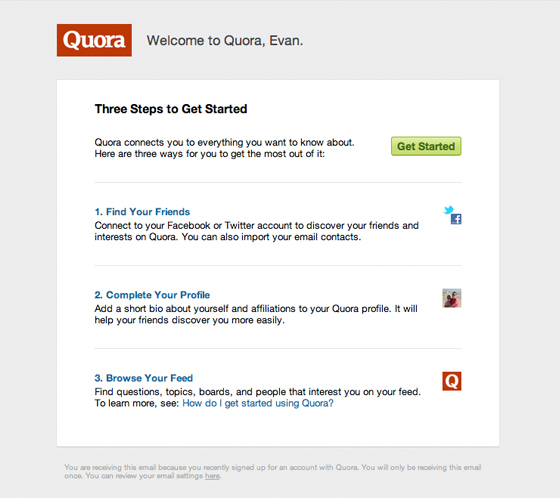 “When users sign up for a service, they might not realize that in doing so they’re also signing up for email marketing. Ease this email tension by taking this opportunity to set realistic inbox expectations,” advises content strategist Katherine Leonard. This transparency builds trust and helps establish a positive relationship. 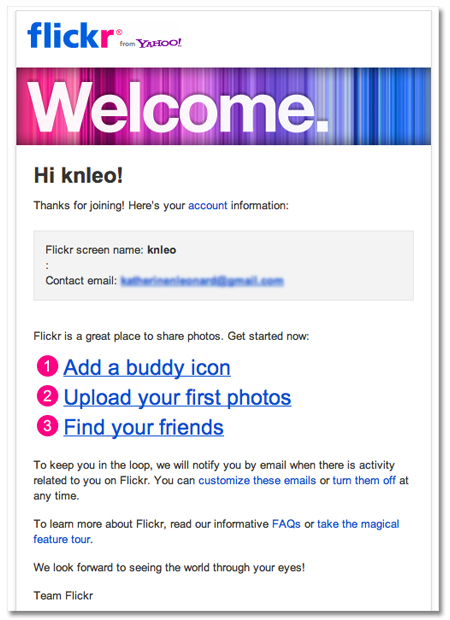 For example, Flickr clearly states in their welcome email “we will notify you by email when there is activity related to you on Flickr. You can customize these emails or turn them off at any time.” The links in the email make it easy for the new user to modify email frequency. The stuff legal makes us say: We can’t stress enough that we are not lawyers, and by no means should any information in the blog be taken as legal advice. The FTC website has substantial information on CAN-SPAM for your reference. Enough with the legalese, let’s get back to the anatomy of a successful welcome email! In addition to thanking your new user, consider rewarding them for signing up. Give them a reason to come back! A popular method is to offer a discount on your product/service (also a great opportunity to offer an upsell) in the welcome email. “Welcome emails with incentives and discounts leads to 2.6x transaction rates,” cites Francisco Rosales, founder of SocialMouths. Another popular option is to offer your top content for free. 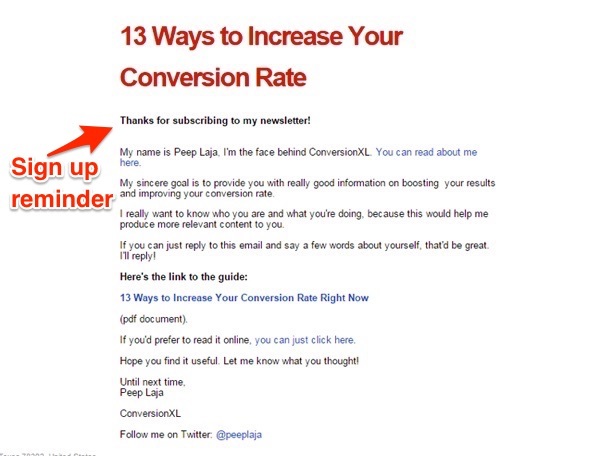 Laja does this in his welcome email (previous example) and SaaS influencers Neil Patel and Lincoln Murphy also offer some of their top content to new subscribers. What do we always say? We can’t stress enough how critical onboarding is for SaaS success! According to Arkenea‘s Nidhi Shah, “approximately 25% of subscribers do not engage with a brand because they are not on-boarded correctly.” Include onboarding tips in your welcome email. Your welcome email should have clear, concise instructions on how the subscriber can begin using your product or service. Think “lists, bullets, and visuals,” says Leonard. Remember, better onboarding is an important part of customer success and reducing churn so it’s vital to start off with your best onboarding foot forward in the welcome email. 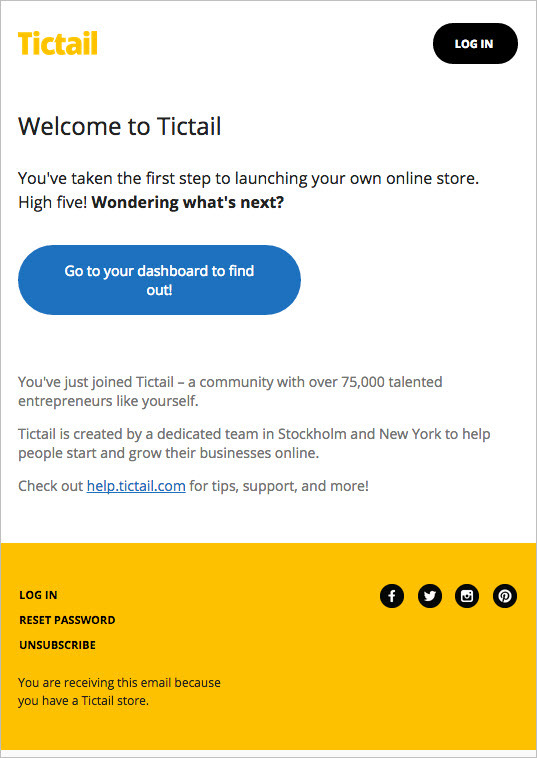 We’ve talked before about how a clear call to action helps increase free trial conversions, and it is important in the anatomy of your welcome email as well. “Every welcome email should have a specific goal (in addition to saying “hello”)” and the CTA should address that goal, according to Daly. Common examples include “complete your profile” or “complete your first _____” as the welcome email call to action. Opinions vary as to the best CTA goal, though ultimately your goal will be unique to your company and subscribers. 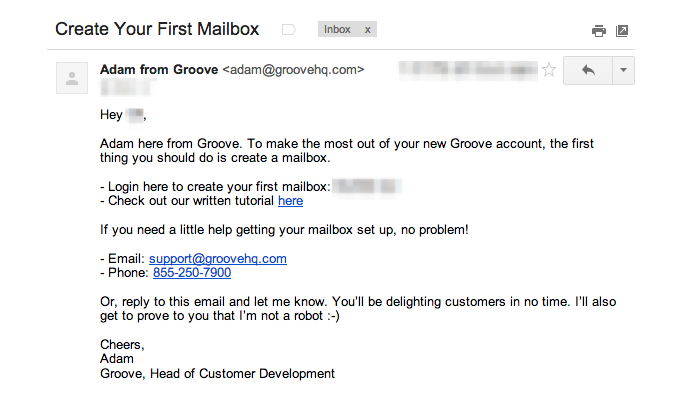 The welcome email below focused on helping the new user start using Groove, and the open rate was approximately 28%. The email above has a 41% response rate and provides “massive amounts of qualitative marketing data about the “decision triggers” that drive people to sign up for Groove,” explains Turnbull. Obviously, a CTA initiating a conversation with your customer works best when the email is from the CEO or founder. Which brings us to the last part of welcome email anatomy . . .
Tell your new user how (and who) to contact if they want to provide feedback or have questions. 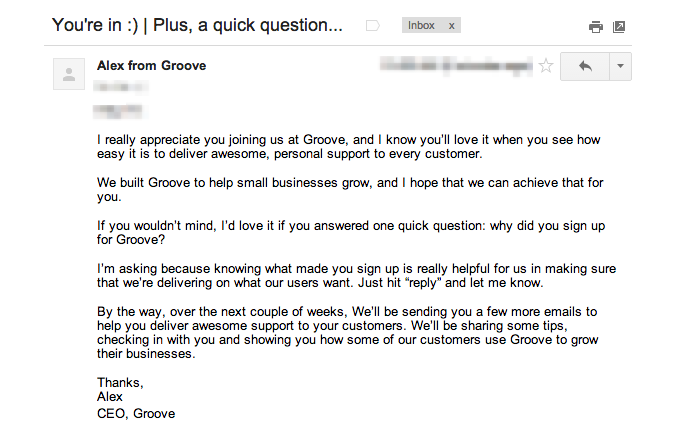 If you are asking the customer to respond to a question in the welcome email, as Groove does, you may still want to provide customer support contact information unless you’re OK with initial customer communication funneling through the CEO. Hopefully it is clear from this post that the focus is on having the right elements in your welcome email. This isn’t an all-inclusive or chronological list. Based on your company’s goals, metrics, and customer feedback you’ll determine if it makes more sense to have a very concise email like Autosend, include an onboarding video like Notegraphy, or start with a simple question like Groove does. Leave us a comment below and let us know if we missed anything that has worked well for you and your company.